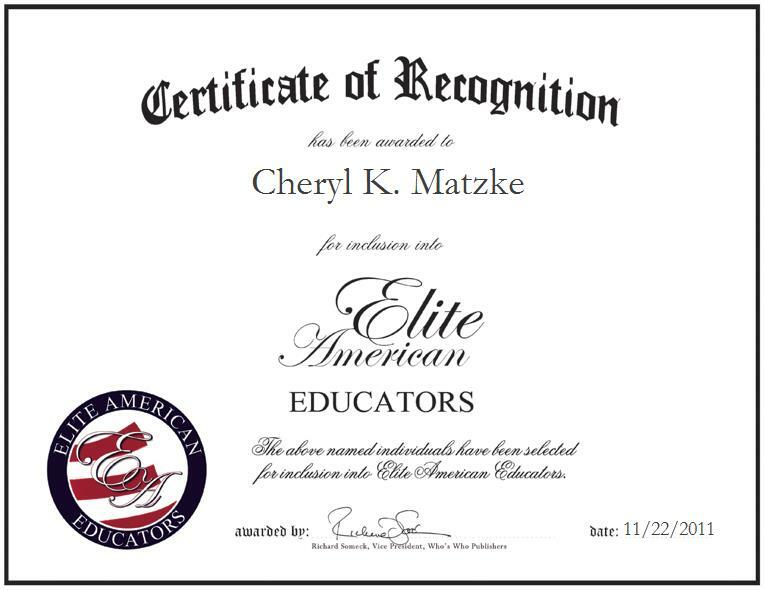 RED LAKE FALLS, MN, November 22, 2011, Cheryl K. Matzke, Teacher at Lafayette High School, has been recognized by Elite American Educators for dedication, achievements, and leadership in English instruction at the secondary level, and collegiate program management. Ms. Matzke began her teaching career 40 years ago at Lafayette High School, along with her husband, who taught history at the time. Together, they raised their five children in their beautiful Minnesota community. Because teaching is Ms. Matzke’s passion, she has been able to follow an illustrious career path and help to shape the futures of the many children that she has taught over the years. She currently teaches secondary English to the students with whom she feels fortunate to work, and leads college-in-high-school programs at Lafayette High School. Ms. Matzke was voted Teacher of the Year in 1989, and she is also a three-time Who’s Who Among America’s Teachers inductee. She takes a fresh approach to the classroom, keeping things relevant to the times, and to the students she teaches. Since she has been in the same school for more than four decades, she teaches the grandchildren and children of her former students. In addition to the leadership role that she maintains as an educator, Ms. Matzke stands strong as a community leader, as she has maintained a long-standing love for giving back to her community. Her husband passed away at a young age, leaving her to raise a family of five, and work on a full-time basis. She has been able to overcome challenges and the obstacle of her husband’s passing, as her story illuminates the saying “it takes a village to raise a child” through the support of members of her own community. She feels fortunate to have had the help of the caring people of her community who have allowed her to keep things going strong. She has also passed down her family legacy, as two of her children are teachers. She hopes that she has led by example, and that they will love their careers as much as she loves hers. She plans on teaching until she feels she is no longer effective in the classroom.